Nobody does it quite like Prince. The rock god played an epic four-hour set at a secret show at the Hollywood Palladium Saturday night—complete with five encores and some secret guests. 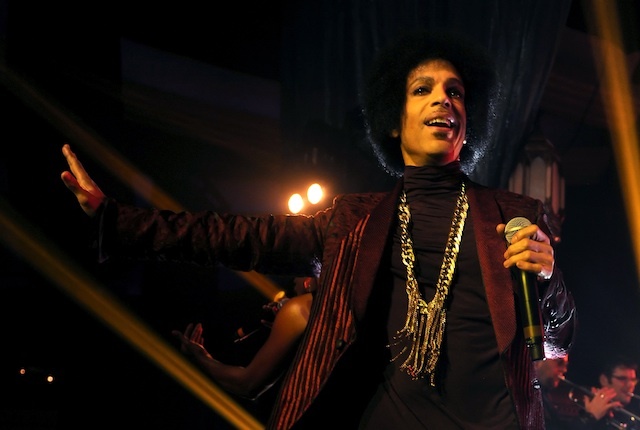 And yes, he was sporting a purple velvet suit and matched it with a turtleneck, huge gold-chained necklace and a black hat sitting atop of his mini-Afro. The concert was supposed to start at 8 p.m., but it seemed like everyone who worked at the venue had something different to say about when they thought he&apos;d get on stage. Friday was the first night in a two-night string of secret shows at the Palladium with his protégé Liv Warfield and NPG Horns on the bill. Bartenders and doormen said he had gotten on stage the night before at midnight after all the other performances, but many pointed out that Saturday night was his night, his time to rock out. But nobody was prepared for his four-hour dance party that they would soon experience. To get the crowd psyched, Doug E. Fresh was the warm-up act, spinning old-school hip-hop tracks from the likes of Notorious B.I.G. and Sugar Hill Gang. And Prince didn&apos;t get on stage until two hours later at around 10:15 p.m. (which actually surprised us that he got on that early—come on, it&apos;s Prince!). Joining him on stage looked like an army of people—rounding out to nearly 20 folks packed like sardines with all their instruments. He had his all-girl band 3RDEYEGIRL as well as all the brass instrument players you could ever imagine (his New Power Generation). Shelby J belted out tracks with Prince with her impressive vocal styling and Prince even brought on stage Janelle Monae and Doug E. Fresh for some freestyling. 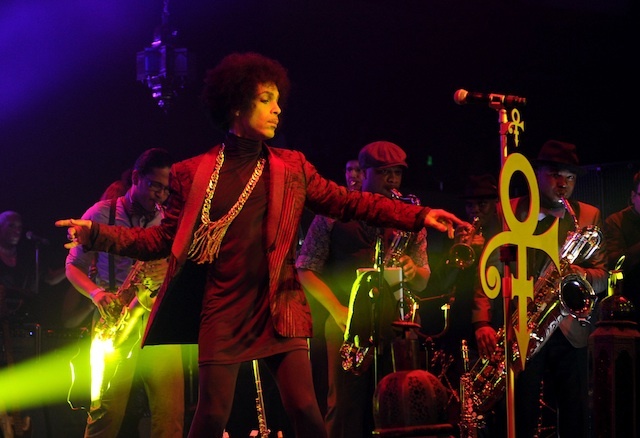 A good amount of the time Prince worked on hyping up the crowd and his band. He kicked the show off with "Big City" and when he performed "1999" early in his set, the crowd erupted in excitement and it set a standard for the rest of the night that he would be playing some of his most beloved tracks, including "Purple Rain," "Raspberry Beret," "Diamonds and Pearls" and "When Doves Cry." Prince even reached beyond his own typical songs to do a beautiful version of the song he wrote that was made famous by Sinéad O&apos;Connor, "Nothing Compares 2 U," and an energized cover of Michael Jackson&apos;s "Don&apos;t Stop &apos;Til You Get Enough." Doug E. Fresh rapped over "If I Was Your Girlfriend." In between songs, Prince would get the crowd to cheer out "Hollywood" (almost to the point where it got a little too repetitive) and seemed to be giving orders to the man working the lights. He&apos;d yell out "Lights off!" or "Lights on!" or "Shine him with your light!" At one point, he even tried to sing out in a funktified way, "Put your phone down. You can&apos;t get down with technology in your hand!" It was true to Prince form and his strong stance against fans taking photos or video of his performances. (Remember how he recently tried to sue some fans for posting bootlegged videos of his concerts online?) There were signs everywhere that read, "NO PHOTOS. PATRONS TAKING PHOTOS ARE SUBJECT TO EJECTION." And indeed, we saw security guards out in the crowds ejecting people for taking videos. Guess he wasn&apos;t kidding! Still, the Palladium served as a backdrop for what seemed like a world where Prince could do whatever he wanted. He finally plucked his guitar at the end of the night for "Let&apos;s Go Crazy." What can&apos;t be argued is how his stage presence is unparalleled. His voice was on point, hitting all those high notes, and he danced up a storm with his crew. Saxophone solos reigned over the night and enjoyably so. We can&apos;t help but bow down to this rock legend.